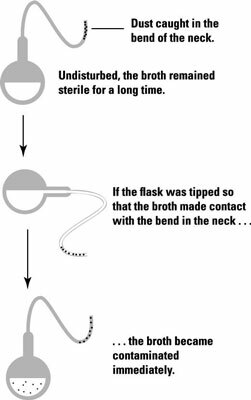 The concept of spontaneous generation was finally put to rest by the French chemist Louis Pasteur in an inspired set of experiments involving a goose-necked flask. When he boiled broth in a flask with a straight neck and left it exposed to air, organisms grew. When he did this with his goose-necked flask, nothing grew. The S-shape of this second flask trapped dust particles from the air, preventing them from reaching the broth. By showing that he could allow air to get into the flask but not the particles in the air, Pasteur proved that it was the organisms in the dust that were growing in the broth. This is the principle behind the Petri dish used to grow bacteria on solid growth medium (made by adding a gelling material to the broth), which allows air but not small particles to reach the surface of the growth medium. The idea that invisible microorganisms are the cause of disease is called germ theory. This was another of the important contributions of Pasteur to microbiology. It emerged not only from his experiments disproving spontaneous generation but also from his search for the infectious organism (typhoid) that caused the deaths of three of his daughters. The organism causing the disease can be found in sick individuals but not in healthy ones. The organism can be isolated and grown in pure culture. The organism must cause the disease when it is introduced into a healthy animal. The organism must be recovered from the infected animal and shown to be the same as the organism that was introduced.